As the latest iteration of Nikon’s J-series mirrorless cameras using a one-inch type BSI CMOS sensor, the Nikon 1 J5 has a much more traditional design than its predecessor. As well as the addition of Program, Manual, Aperture-Priority and Shutter-Priority modes to the main mode dial, the J5 features a secondary command dial on the top plate in addition to the control ring on the back. The 20.8-Mpix sensor is new to this series (the J4 adopted a 18.38-Mpix model), and it has on-chip phase detection AF with 148 sensor points. In combination with the new image processor (Expeed 5A), the J5 can shoot bursts of up to 20 fps with continuous AF, and 60 fps without. The processor is also needed for the 4K (UHD) movie clip option, though unfortunately it’s offered at just 15fps — a little slow for most uses. However, HD movies are a strong point, with clips recorded at up to 1080/60p or 120fps at 720p (both useful for slow-motion on a slower timeline). The J5 has a three-inch tilting touch-screen LCD and has a useful Wi-Fi with NFC option. Like its predecessor, the J5 remains one of the smaller models, measuring just 3.9 x 2.4 x 1.2″ (98.3 x 59.7 x 31.5 mm), and weighs 9.35 oz (265 g) with card and battery. It’s available now with the 1 Nikkor 10-30mm VR zoom at around $499. 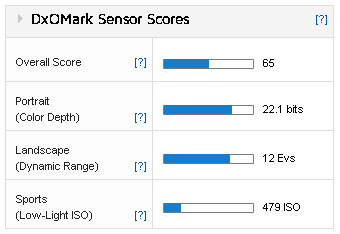 Achieving an overall DxOMark sensor score of 65 points, the CX format (one-inch type) 20.8-Mpix sensor in the Nikon 1 J5 sees a dramatic and very welcome improvement in performance over earlier models. Noise levels are still on the low side, but the dynamic range and color discrimination are both very good for this class. It now takes its place alongside the one-inch sensors in Sony Cyber-shot DSC-RX100 models and Panasonic Lumix DMC-FZ1000s, well as some of the larger Micro-Four-Thirds sensors adopted by such models as the Panasonic Lumix DMC-GM5 and the DMC-LX100. As a matter of fact, the Nikon 1 J5 ranks in 154th place alongside some APS-C models such as the Canon EOS M and M2 and the earlier EOS Rebel T3i (EOS 600D). The previous iteration, the Nikon 1 J4, is ranked in 235th place alongside the Nikon 1 V3 and the Olympus PEN EPL3 and EPM1, among others. Against its predecessor the Nikon 1 J4 and the maker’s top-of-the line Nikon 1 V3, which both adopt the earlier 18.38-Mpix sensor-module, the new Nikon 1 J5 sees significant improvement in sensor performance. 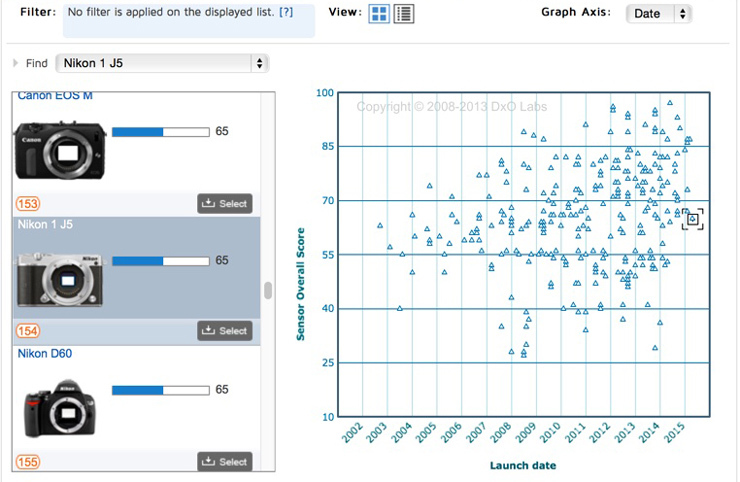 While ISO performance remains largely unchanged, both the color depth (discrimination) and dynamic range are greatly improved. Users will welcome the extended dynamic range of +1.3 Evs at base ISO, although any improvement from ISO 400 upwards is marginal. Increased color sensitivity of around one bit throughout the ISO range is impressive, and the 22.1-bit measurement at base ISO is excellent. A high 12 EV dynamic range at base ISO is excellent, but improvements can be seen throughout the ISO range, albeit slight from ISO 400 onwards. 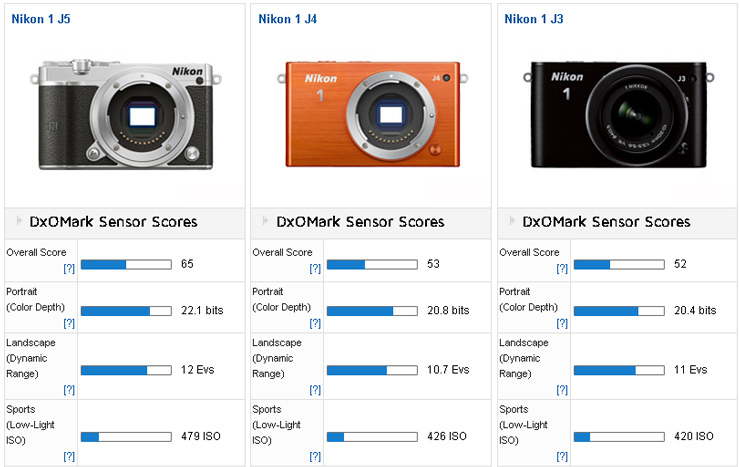 When compared with the Sony Cyber-shot DSC RX100 III, it appears that the Nikon 1 J5 has a related sensor. It has similar color discrimination, dynamic range, and noise — although to be fair, Sony has squeezed a little more from the sensor than Nikon. 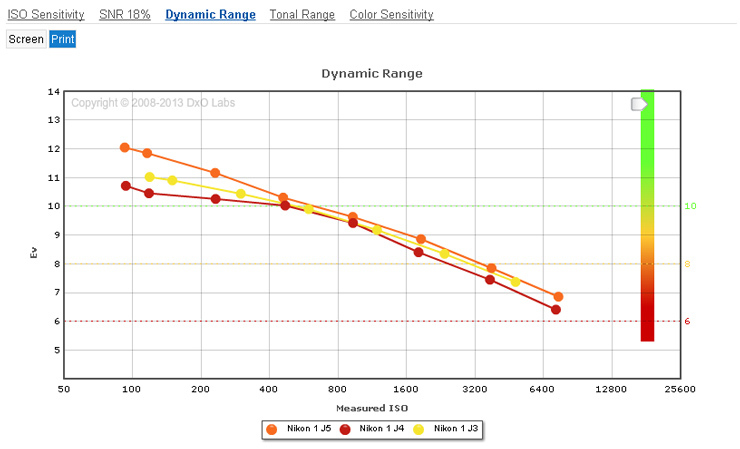 Chroma noise (indicated by color sensitivity) and dynamic range at low and high ISOs are practically identical. That’s good news for prospective purchasers of the Nikon 1 J5 and suggests, albeit tentatively, that the sensor may be featured in the yet-to-be-announced update to the present Nikon 1 V3. The one-inch-type sensor also performs closely to that of the larger Micro-Four-Thirds unit in the Panasonic Lumix DMC-LX100. That model, however, has slightly better dynamic range and lower chroma noise (and therefore better color sensitivity) through to ISO 6400. 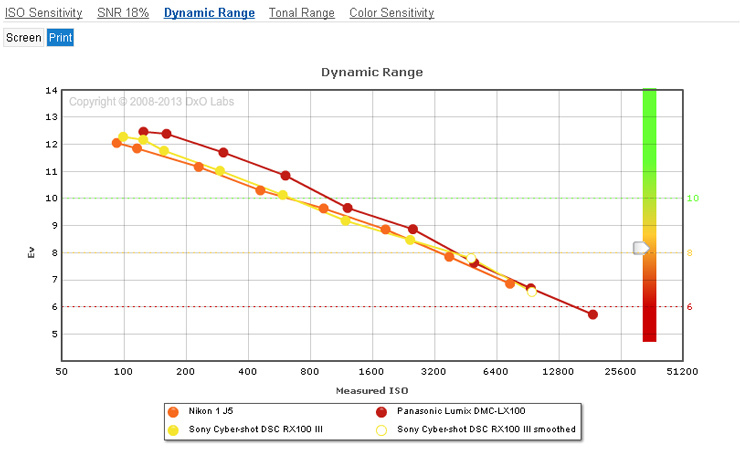 Dynamic range is impressive: it appears the Nikon I J5 uses the same or at least a related sensor as that found in the Sony Cyber-shot RX100 III. 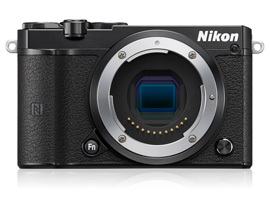 On paper at least, the Nikon 1 J5 looks like a serious contender in the mid-range mirrorless segment. In the past, the Nikon 1 models have lagged behind in sensor performance but with the shift to this back-illuminated 20.8-Mpix sensor, that’s no longer the case. 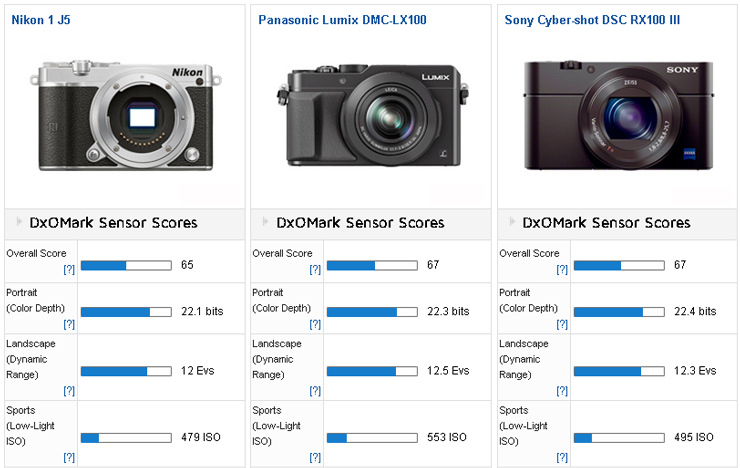 The sensor in the Nikon 1 J5 is comparable in performance to the unit found in the Sony Cyber-shot RX100 models, and we assume it’s the same or at least a related sensor. It’s a welcome boost for Nikon in this segment, competing not only with the small Sony compacts but also some larger (Micro-Four-Thirds) sensors, such as that found in the highly-regarded Panasonic Lumix DMC-LX100. The Nikon 1 J5 is the first mirrorless model with interchangeable lenses to adopt this sensor, and as a result, the future of the Nikon 1 system as a whole now looks a lot more promising.